In February, she led a closed-door meeting to talk about how trustees should restructure their group, a clear violation of the law. Once a week, her executive committee meets by phone to talk about whatever she deems necessary. And last night, as Penn Staters everywhere braced for the release of the Freeh report tomorrow, trustees President Karen Peetz and 21 other board members held secret talks to figure out how to respond to the investigation’s findings, ESPN reported yesterday. Described as a “wide-ranging strategy session” that lasted about 30 minutes, trustees talked about concealing thousands of memos, emails and other documents that were turned over to Freeh’s group, ESPN reported. They also plan to discuss the report’s findings in small groups tomorrow, a tactic public officials routinely use to skirt open meetings laws. Once their ducks are in a row, university President Rodney Erickson will hold an afternoon press conference with trustees Ron Tomalis and Ken Frazier. Secret. Closed-door. Those words have continued to define Karen Peetz’s presidency. With demands for greater transparency, you’d think Peetz and her trustees would do everything they can to at least look like they’re trying to be more open. But none of them have caught on to what the rest of us demand. Holding meetings in the open whenever possible is obviously the right thing to do. The additional scrutiny leads to greater accountability, and fosters public debate about proposed policies. But public officials rarely consider whether they should meet in private or not. If they’re allowed, or if they can get away with breaking the law, they will. Penn State is no exception. Take this defense of the closed-door meeting from someone who attended it, presumably a trustee. A source with first-hand knowledge of the call defended the appropriateness of the discussion, saying it was mostly about logistics of how the trustees should handle the release of the Freeh Group report. “It was a logical conversation about how the board is going to handle the discussion when the report is issued on Thursday so the board can prepare the appropriate response,” the source said. Sure, it’s logical for any public official to want to get their ducks in a row so they can put together a strong, united front before being subjected to public scrutiny. But that doesn’t lead to better policies, which is why citizens have the right to participate in the deliberative process. 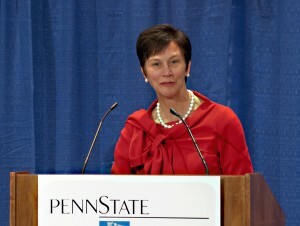 Real leadership would entail putting an end to the culture of secrecy that has permeated Penn State for decades. Maybe tomorrow’s report will address just that, and lead to some sort of meaningful change. But it’s clear Karen Peetz won’t pursue transparency on her own. She should step aside, and let somebody else take that on.